And Tracy Lord has no remorse. For what news they can finagle. Miss Lord’s both sore and spiteful ex. Despite her coming wedding day. And who she’ll choose to call her wife. 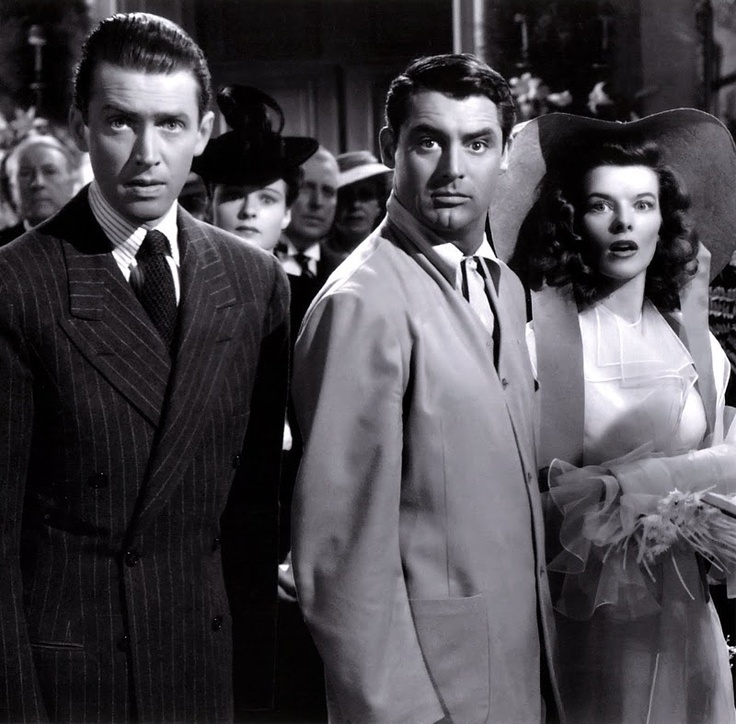 The Philadelphia Story is just one of the many old black-and-white films lauded by the AFI, which I’ve only begun to check out. It made #51 on their original top 100 list, and the 2007 update raised it to #44, since it’s supposedly such a classic. It’s said to be the best example of the comedy of remarriage, a genre popular at the time; if that’s true, I have little hope for any others. As much as I hate to dissent from the critical consensus, I was not impressed and consider this an example of a film undeserving of its classic status. With such famous actors involved, I had expected more. I love Jimmy Stewart, who earned a Best Actor Oscar for his role as writer Macaulay “Mike” Connor. I like Katharine Hepburn too. I have no feelings whatsoever about Cary Grant. Yet I did not enjoy this film, because of that lynchpin of any good film: the script. While the critically lauded, Oscar-winning screenplay was clever at times and had some humor, mainly from Stewart, such as his encounter with a linguistically old-fashioned librarian, the script was, shall I say, too flowery. Many call it elegant; I call it pretentious. The work of famed dialogue writers like Aaron Sorkin and Nora Ephron may be idealized beyond the typical limitations of ordinary speech, but as I was watching The Philadelphia Story, my VC and I kept thinking, “No one talks like this!” I don’t even think wealthy people in 1940 spoke like this. Flowery language can be cheesily poetic, such as in It’s a Wonderful Life when George Bailey says he’ll give Mary the moon: “Well, then you can swallow it, and it’ll all dissolve, see… and the moonbeams would shoot out of your fingers and your toes and the ends of your hair…. Am I talking too much?” When lines like that make up the bulk of a film, though, the answer to that question is a resounding “Yes!” A protracted and rather awkward exchange between Stewart and Hepburn in a night garden prompted my VC to call it one of the worst romantic scenes she’d ever seen. I wouldn’t go that far, but she disliked the film more than I. On top of the dialogue issue, I didn’t care for any of the characters, particularly Hepburn’s impudent Tracy Lord. As various people pile on the accusations of her considering herself a “goddess,” I found it hard to believe that no one had called her that before and was unsure why it would suddenly bother her now. I didn’t really feel sorry for this controlling bride-to-be, with her “poor little rich girl” mentality. Anticipating the popularity of reality shows and inside looks at the rich and famous, Stewart muses, “The prettiest sight in this fine pretty world is the privileged class enjoying its privileges.” I, for one, can think of much more entertaining sights.